SAN DIEGO, Jan. 4, 2018 /PRNewswire/ -- MyDx, Inc. (OTC: MYDX), a science and technology company and creator of MyDx® (My Diagnostic), the first multi-use handheld chemical analyzer designed for Cannabis professionals and retail consumers to correlate the chemical profile of cannabis with how it makes them feel and which ailments it alleviates, today announced it has agreed on terms and entered into a Letter of Intent to partner with Highsmen Genetics to form a new Exclusive Joint Venture. The technology behind Highsmen to develop stable customized genetic strains for certain effects is expected to help MYDX360 customers realize additional brand loyalty through end-user input in the MyDx App that will now influence the flower breeding programs that power the product lines they are consuming. "Imagine there was a technology to create a custom cannabis flower that is highly effective to treat lower back pain, anxiety, or sleep disorders. That's what we're working towards," stated Daniel Yazbeck, CEO of MyDx. 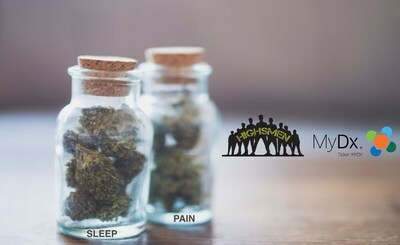 "We are very excited to exclusively partner with the Highsmen team because we believe their unique approach to genetic profiling through stable breeding will help us achieve this goal as MyDx continues to grow one of the largest preclinical databases in the world that ties cannabis chemistry to end user feedback," concluded Mr. Yazbeck. "Our partnership allows us to define genetics exclusive for each client, gain direct patient consumer feedback towards that strains profile and build a layer of trust that you can have the same consistent experience each time you consume cannabis," stated Joe Floyd, Founder and President of Highsmen Genetics. "It also opens the door for known personalities, athletes and those who may be cautious to step in the cannabis space a safe way to brand their own strain and distribute it directly into the cannabis market," concluded Mr. Floyd. MYDX and HIGHSMEN have agreed to enter into a 50:50 Exclusive Joint Venture where the HIGHSMEN Genetics Technology will be offered exclusively to MYDX360 customers. Access will be limited and initial MYDX360 customers will be offered the service on a first come basis. Initially, Highsmen and MyDx will focus on producing a stable 1:1 THC to CBD genetic line developed by HIGHSMEN. The goal is to be able to produce a custom flower strain with custom cannabinoids and terpenes that can be tailored for specific end use applications, such as sleep or pain relief, which will power natural products developed and offered to MyDx360 customers. MyDx will continue the breeding program with HIGHSMEN with the goal of creating a custom flower strain for every physiological effect MyDx and its MyDx360 customers are seeking for their respective markets, backed by customer feedback via the MyDx App. MyDx360 customers are also expected to be able to leverage the combined networks of licensed producers and manufacturers to produce the necessary volumes of customized flower at more cost efficient prices. Additionally, MyDx will equip HIGHSMEN with the CannaDx handheld analyzer and tracking App in order to catalog the genetic lines, strain lineage, input from consumers, and chemical makeup that function within the breeding program. MyDx360 customers are expected to able to utilize this service in products as soon as the first quarter of 2018 with custom flower being deployed as early the second quarter of 2018. The technology behind the natural breeding process at HIGHSMEN begins with Genetic profiling, where customers define the traits desired for the custom strain flower they are breeding for. If a client suffers from insomnia, the cannabinoid and terpene profile of the cannabis flower that will relief that symptom must have a certain chemical makeup to achieve that desired effect. In an extremely simplified example, one can cross a high THC strain with a high CBD strain to potentially create a 1:1 THC to CBD producing product. This is in contract with the GW Pharmaceutical approach, where they genetically modify the DNA of a certain strain in order to produce a CBD rich strain. By understanding the genetic makeup of their male breeders, the HIGHSMEN breeding program is able to expedite the breeding process by stabilizing strains much more quickly and in turn defining a chemical profile with a more consistent outcome. Other traits that can be tailored in the program include yield, height, size, indoor vs outdoor centric strains as well as strains less prone to infestation. Taking it one step further, by utilizing the MyDx crowdsourced feedback ecosystem and data that is collected from consumers to influence the breeding program, the Company believes it can apply trends obtained from the data to refine the breeding approach. The goal is to entice the patients to further input their experience in relation to their strain profiles now knowing that their input will affect the integrity of products they are consuming. That said, with the legalization of recreational cannabis in California now in full force, the science is quickly catching up with the legalization and there remains much development that needs to be done to achieve the Company objectives. To learn more about MyDx360, please visit www.mydxlife.com/mydx360 or email MyDx customer service at info@mydxlife.com with any questions you might have. To learn more about Highsmen Genetics, please visit www.highsmen.com. MyDx, Inc. (OTC:MYDX) is a chemical detection and sensor technology company based in San Diego, California whose mission is to help people Trust & Verify® what they put into their minds and bodies. The Company's first product, MyDx®, also known as "My Diagnostic", is a patented multiuse hand-held chemical analyzer designed to help consumers and professional test for pesticides in food, chemicals in water, toxins in the air, and the safety and potency of cannabis samples, which is the initial focus of through the CannaDx™ application. CannaDx users have submitted over 40,000 crowdsourced datapoints revealing the chemical profile of the cannabis they are consuming and how its making them feel which feeds a data analytics platform, a SaaS business, as well as the biopharmaceutical division of MyDx. The company is committed to addressing areas of critical national need to promote public safety, transparency and regulation in the various markets we serve and hence its more immediate mission is to continue to develop smart devices as part of an ecosystem that crowdsources consumer generated preclinical data to drive innovation in the cannabis industry. For more information, please visit www.mydxlife.com. HIGHSMEN is recognized for their unique approach to cannabis breeding and an ongoing attempt to further stabilize each genetic line to provide a more consistent experience for the end consumer. Highsmen aims to produce consistent cannabinoid and terpene profiles through the understanding the importance of dominant and recessive traits when breeding new cannabis strains with strong male breeders. Highsmen currently offers catered cannabis strains and the HIGHSMEN breeding service called Strain In Your Name which will be now offered through MyDx360. HIGHSMEN's founder Joe Floyd has a history of breeding that goes back more than 10 years. In addition, Mr. Floyd has a strong data analytics, software engineering and user interface design background which was gained during a 15 year career in the video game software development industry at companies such as Microsoft Game Studios, Electronic Arts, SEGA of America and Telltale Games. To learn more, please visit www.highsmen.com.